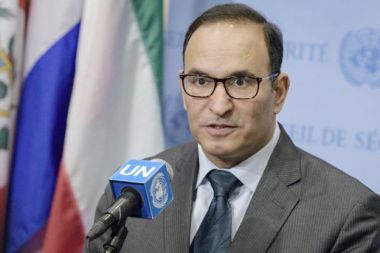 NEW YORK-- Kuwait Representative to the United Nations Mansour Al-Otaibi said Wednesday the question of Kuwaitis and third country nationals who went missing in Iraq during the invasion of Kuwait in 1990 continues to be "an unhealed wound." The families of those missing people are still suffering and waiting to know the whereabouts of their loved ones, he said during a Security Council session on the situation in Iraq. Since 2004, no progress has been made in the search for 236 out of 605 missing people, Ambassador Al-Otaibi complained. "The 28th anniversary of the catastrophic invasion of Kuwait has passed a few days ago. Since then, the Security Council has been busy addressing the impacts of that disaster. "The Council adopted dozens of resolutions and many of the obligations stipulated in these resolutions have been met. "However, the question of missing Kuwaitis and third country nationals which is a humanitarian issue cited in the UNSC resolutions 687 (1991), 1284 (1999) and 2107 (2013) has yet to be addressed," he explained. Ambassador Al-Otaibi appreciated the efforts of the International Committee of the Red Cross (ICRC) - the chair of the Tripartite Commission, tasked with ascertaining the fate of missing and POWs during the 1990-1991 Gulf War. The Tripartite Commission is composed of representatives of Iraq, Kuwait and the 1990-1991 Coalition (the United States, the United Kingdom, France and Saudi Arabia). Al-Otaibi also thanked the Iraqi government, represented by the Ministry of Defense, urging it to double its efforts in order to end the suffering of the families of the missing people. He called on the UN Assistance Mission for Iraq (UNAMI) to pursue its mandate and speed up ascertaining the fate of the missing Kuwaitis and retrieval of the stole Kuwaiti property as per the provisions of the UNSC Resolution 2107. He reaffirmed Kuwait's support to the UNAMI chief Jan Kubis and the Iraqi government in this regard. In statements to KUNA following the UNSC session, Al-Otaibi reiterated that Kuwait would spare no effort in support the Iraqi government, the UNAMI and the Tripartite Commission in their quest for locating the whereabouts of the missing Kuwaitis and third country nationals. Earlier today, Kubis, who is also the Special Representative of the UN Secretary General for Iraq, briefed the Security Council on the latest developments of the situation in Iraq.